This is another piece from One Month’s 30 Day Writing Challenge. The assignment was to create a monster. I also tried to write it in the voice of my crazy, hilarious daughter. Again, it’s a bit of a risk to share my attempts at writing fiction, but I want to share it and see what people think. Thank you. Fridgy is big, fat and gentle. Or at least mostly gentle. When I say mostly gentle I mean he hasn’t killed anyone. This week. Fridgy likes ketchup. Big bottles of red ketchup. Not so much with the catsup. Can anyone tell me what exactly is catsup? But back to the ketchup. Fridgy pours ketchup all over his food. Food becomes a ketchup vehicle for Fridgy. Like a pickup truck filled with ketchup. Slurp. You can’t imagine how much he likes ketchup. Especially on people. But I did say he hadn’t killed anyone. This week. Last week, hmm. Let’s talk about that in a bit. First you must forgive me. I got ahead of myself. Let me tell you more about Fridgy. Fridgy is a Gombor. Not your typical Gombor, all bad manners and farts and burps and bits of people stuck between the teeth. No, Fridgy farts and burps a bit, but he flosses and knows not to do his business in the house. Well, he knows not to, but it has happened. That’s why I have that shovel. And that bucket. So I said he wasn’t your typical Gombor. Nope. Fridgy used to be a plain old, regulation, run of the mill Gombor, hiding under beds and in closets and in nightmares and old abandoned houses. He burped, farted and ate skunks and squirrels and scared old people and kids for fun. Naps. Snacks. Pranks. Naps and Snacks. Snacks and pranks. Pranks and naps. But he stepped on my skateboard. Huh? Well, maybe not huh, but I don’t think there is a word for what went through my head when I felt the weight. Or was it the smell. The problem is Gombors are heavy. And they stink. Like worse than poop stink. So a loss for words isn’t really right. It was a can’t even before we couldn’t even. And I couldn’t even. Breathe. Scream. Move. But I could punch. And I did. Gombors could be confused for Golems. Big. Brown. Scary. Until you punch them. 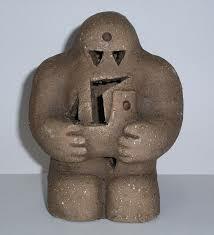 Golems don’t cry. Gombors do. Bigs tears and lots of snot. Which is why I can say murderous and gentle. Or murderously gentle. Gently murderous? An oxymoron of soft, damp Gombor with a big goose egg on his head on my bed. Because of the skateboard. Or because Gombors can’t skate. Or at least not very well. They are good at stepping on skateboards. And good at achieving a high rate of speed. And good at stopping. Abruptly. Headfirst. Just bad at not hitting their head and getting knocked out and winding up on top of me. Waiting to get punched. In the head. By me. And they are good at eating old ladies. But would that be good or bad? Bad for old ladies. Good for Gombors. And people who sell ketchup. And tomato farmers. Unless they are old ladies. So Fridgy cried, but he wasn’t named Fridgy then. That came later. Before the old lady and after the punch. So using Kleenex is not a thing Gombors do well either. Or using them the right way. They are good at using them the wrong way. And I don’t think the box shows the right way and Gombors can’t read. Unless it says catsup. So never give a crying Gombor Kleenex. And the old lady was kind of an accident. Gombors like to eat. I mean really eat. Like eat the guys who eat the hot dogs for the world championship eat. Or a six pack of biggest losers eat. So one old lady was like a toothpick. A toothpick with ketchup. And she was kind of dead anyway. From the scaring and the screaming and the falling down and the Gombors get hungry and some stuff happened. But I called him Fridgy because he ate one. Not an old lady. A fridge. My fridge. Ice cube trays, the box of baking soda that doesn’t absorb odors and that jar of quince jelly that has been in the family since the gift basket of 1987. One bite. One crunchy freon filled bite. This week has been murder free. 7 days since our last on the job injury. No old ladies have been harmed in the making of this week. There was a raccoon. And a feral cat. A Christmas wreath. And some nachos. Well, more like a Taco Bell. But there were nachos inside. And now I am stuck. With a Gombor. A big, fat and gentle Gombor. Good Gombor. Down Fridgy. Down boy. No, I don’t have any nachos. Fridgy, is that ketchup on my arm? Fridgy? FRIDGY!?! ?